I am working on two blogs about a recent research trip to Kossuth County, Iowa. Shan and I wondered when did we learn that the "Hungarians" were "German-Hungarians" who are now "Burgenlanders ?" In searching through my files I came across this Blog that I forgot to publish. Here it is now. I have been trying to track the Frank and Rose Schotl family as they moved from the country to the city of Saint Paul. I wanted to know where they settled, who their new neighbors were, and at what jobs they were employed. Four of their children: Martin, Lawrence, Leonard, and Bernice were born in Forest Lake. They moved to St. Paul in about 1918 and soon after were joined by siblings Pearl (1920) and Herbert (1923). 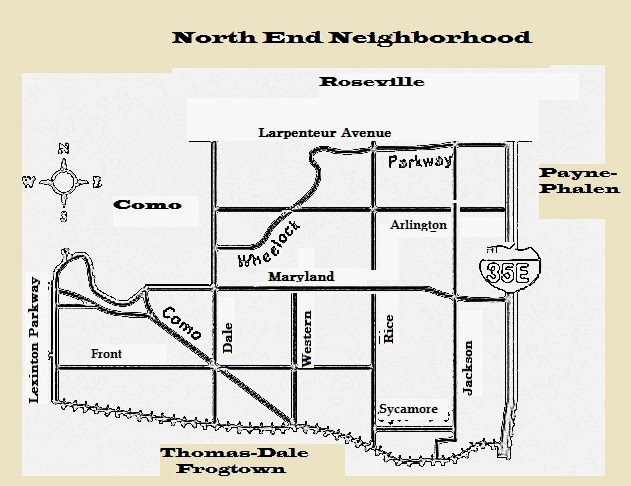 The neighborhood was known as the North End with Rice Street being the main thoroughfare and main street of commerce. We found them on Saint Paul City Directories, and the Federal Census for 1930 living at 28 East Maryland Avenue. This may have not been their first residence. Donald L. Empson in his book, The Street Where You Live: A Guide to the Place Names of St. Paul mentions the North End as being "roughly between the Burlington Railroad tracks and Larpenteur Avenue, between Western Avenue and Oakland Cemetery/Jackson Street." a report on housing conditions in St. Paul in the 1930's "... is in the main part composed of those of Hungarian extraction or birth who as a group seem to be of low civic consciousness. For the most part they are a laboring class and this would indicate well kept homes which is more or less true. The houses are however for the most part poorly built and no amount of attention will entirely remedy the initial inadequateness." Mr. Empson's elitist attitude seems to be the kind of rationale which was often used to demolish a neighborhood or run a freeway through it. In other words, we will have to destroy the neighborhood in order to save it. Anyhow, the neighborhood did survive, and many immigrant families practiced their folkways and raised happy, healthy children. The children in our family, for the most part, attended the area public schools including Geranium Street School also known at the time as the Robert A. Smith Elementary School. The sign indicates this is two separate classes A6 and B7. I think the top two rows are the 6th graders and the bottom 3 rows are the 7th graders. My mother, Bernice Schotl, is pictured in the 2nd row from the top among the 6th graders. The School Crossing Guard Patrol was chosen from the highest class. Note all the belts and badges of the Patrol members of those in the first 3 rows. Getting Back to the Schotls, I found that Martin Schotl had married Anna Peck, daughter of Frank and Mary Peck ca. 1935. They moved in with Anna's widowed mother, Mary, at 1220 Woodbridge in Saint Paul's 8th Ward. They were still living there in 1940 after the birth of their son Kenneth. Also in the household were Anna's brothers, Joseph and Michael Peck. Martin's occupation was given first as a driver and later as a baker for Hugo Koenig. One evening as I was working on the Martin Schotl tree, I "Googled" Schotl, Peck and Rice Street and scrolled down to find an article by Rosemary Ruffenach in the 2011 Saint Paul Almanac entitled Great-Grandma’s Fur Coat [the entire article is linked] Ostensibly the article was about the coat made of dyed rabbit fur, that Rosemary now owns, but it was really more about her people and their immigration and settlement on Saint Paul's North End. Her grandmother was a Peck. Rosemary writes of her grandmother, "Her family arrived in Saint Paul one cold April afternoon in 1888, when she was thirteen years old, along with sixty other immigrants from Andau, Austria (then Hungary). They were dumped on a Saint Paul sidewalk by their travel 'expeditor'." Her grandmother managed and later owned a grocery store on Rice Street and "the coat would have graced Grandma's shoulders during Mass at St. Bernard's Church in Saint Paul's North End community." Well this seemed too much coincidence to let pass. As least I wanted to find out more about Rosemary. She is listed on one site as instructor at secondary and post-secondary levels, teaching in the areas of language arts, social studies, visual arts, and journalism. She has a doctorate from the University of Minnesota and has published numerous articles in the local and national press. Her essays have been included in the Minnesota Book Award-winning Voices for the Land Anthology (Minnesota Historical Society Press), 2002, Voices for the City anthology (1000 Friends of Minnesota/ Milkweed Press), 2003, and Saint Paul Almanac, 2011. 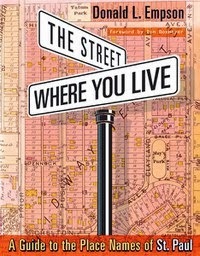 I wanted to make a contact with Dr. Rosemary Ruffenach and compare our family history in the Rice Street Neighborhood. Shan took the initiative and received a immediate response. "I would be happy to answer questions." Rosemary also sent us the article she wrote titled "Bless My Homeland Forever." It is about the Austro-Hungarians coming to St. Paul. It was included in the Minnesota Genealogist Vol. 38, No.1. "The Pecks had settled at 1225 Woodbridge Street by 1893 and stayed there, with John listed as a 'laborer' in the city directory until 1911, when he was 75. After John’s death in 1914, Elizabeth moved in with their married daughter, Elizabeth Peck Tell, and her family in Minneapolis. Son Leonard married within a decade of arriving and moved into 1223 Woodbridge Street. Their third son, Martin, age three at the time of emigration, later came to reside at 1186 Woodbridge Street, and grandson Bernard (son of John Peck, Jr., and Eva Laber) moved in down the street at 21 East Maryland Avenue." There are always questions about the reason or reasons some one or some family decided to leave for a new country. Life was not easy for German-Hungarians (now known as Burgenlanders) beginning in the 1870s. A worldwide economic depression struck in 1873 following the crash of the Vienna Stock Exchange. • 1888: very long, cold winter with unusually large snowfall. Since the 1880's when the German-Hungarians began to settle in the North End, attracted by the jobs with the Railroads, they reached out to family and friends back home to join them in this developing ethnically friendly neighborhood. Thanks to Charlie Deutsch of the St. Paul Burgenland Bunch, we have the records of St. Bernard's baptisms, marriages and deaths. Through the Saint Paul City Directories we could locate addresses and occupations. Through the various Federal Census we could find out ages, language spoken, place of birth and double check the addresses. Thanks to the Burgenland Bunch, we now had the larger context of the many German-Hungarian Burgenlanders who had emigrated to the United States. This group of genealogists have been doing the research for many years and share the information through their web site. We were able to join the club and add our searches to theirs. Text and Images are the property of Gerald F. Glaeve. Simple theme. Theme images by luoman. Powered by Blogger.